Know at a glance how you’re doing with your monthly goals with My Money Map, our easy-to-use money management tool. 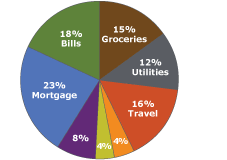 It’s easy to manage your spending and create budget goals using My Spending Report with Budget Watch. Every transaction you make — including your Wells Fargo Credit Cards, Debit Cards, checks, and Bill Pay — is automatically tracked and sorted into familiar categories so you have a complete financial overview in one convenient location. Budget Watch helps you set up a budget based on your actual spending history and then automatically tracks your progress, with transactions updated each business day. You can see “what’s left” and use that money to build savings or pay off a loan. Use My Savings Plan® to set a personal savings goal — such as a “rainy day” fund or your next vacation. Visual tools like interactive charts and customizable alerts will inform you of your progress. It’s never too soon to save for retirement, and it’s easier than you might think. My Retirement Plan® can help you set a realistic savings goal that’s tailored to your needs — and a realistic plan for pursuing that goal.